Who says money doesn’t grow on trees? Just ask some of the growing number of hemp farmers planting in Tennessee. Many believe hemp is on the verge of becoming the state’s next big cash crop. Go to a hemp farm and the plants literally glisten in the warm, fall sun, swaying in the breeze. “This looks like marijuana. It’s pretty, isn’t it,” said grower, Clint Palmer. It’s hemp, and at long last many believe this is heir apparent to Tennessee tobacco. The crop is mature and ready for harvest. “Is this the next big cash crop?” NewsChannel 5’s Nick Beres asked. “One hundred percent, no way around it,” said Palmer. He’s one of the state’s top hemp experts who is cultivating a crop just outside Murfreesboro. It is bursting at the seams with two hemp varieties named bubblegum and sweeten — all grown from state-approved seed. Consider tobacco farmers get between $3,000 – $5,000. 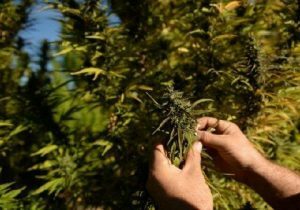 Palmer said you can easily grow 1,000 hemp plants on one acre — and each plant provides about one-pound of usable bud. “That’s thousands of pounds at an average of about $50 a pound off one acre,” said Palmer. You do the math – about $50,000 for one acre. It’s easy to see why the number of hemp farmers is expected to grow exponentially in the next few years. Demand for the hemp is great and stems from the growing use of CBD. Unlike marijuana, hemp does not have high levels of the psychoactive drug THC. So hemp doesn’t produce a high and is legal in Tennessee. “The chemical profile is what makes it different,” said Palmer. People consume CBD in oils, gummies or smoking the hemp buds, claiming it helps for everything from seizures to anxiety to pain. “The CBD is in the glandular bulbus tricombs,” said Palmer. In other words, the buds and the market for those tricombs is booming. “This plant is special because it has a high level of CBD. You smell and it’s fruity and citrus,” said Palmer handling one of the plants. He is now harvesting the mature crop. He’ll sort them, dry them then process the plants. Then it’s off to market, and a profit seldom seen for a legal crop in Tennessee. Anyone interested in growing hemp can do so, but must register with the state.